Its been a tough couple of days in the west with more snow than we have seen in a long time. 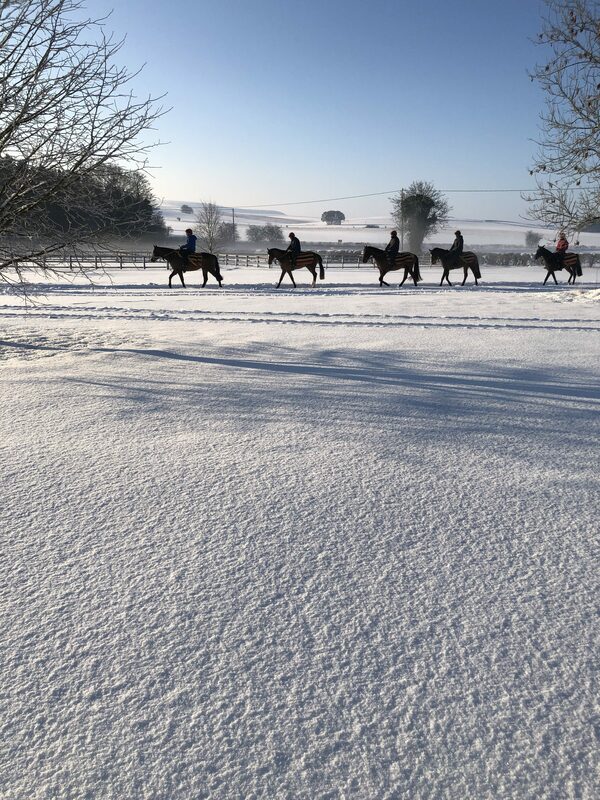 Alan King who is up the road has been unable to get the horses out of Barbury Castle. Creationist headed to Newcastle a day early to beat the snow, and luckily it paid off. It was a small field and his main rival had run well in Ireland and was in receipt of seven pounds. All in all a very satisfactory result and he is now two from two for the season. He is heading for a mark below 85 on his form and he will probably wait for the turf season now as he has had three quick runs but he remains a horse with potential. At 1130 am he walked back in to the yard safe and sound. At Kempton this evening Chop Chop makes her second start. She didn’t run as well as we expected at Newmarket on debut, but a reason came to light immediately after the race. She is a nice filly who will strip fitter for the run for sure, but should run nicely. She is the daughter is out of a yard favourite in Mince and we hope she improves as rapidly as her mother did! Yimkin runs in the 1 mile fillies novice, on what is her second start of her career. She showed some promise on her debut in a race where a lot of the horses have good ratings, but some of them may be a bit higher than they actually should be. She stayed on well that day. She will definitely come of for todays race and is carrying a bit of condition as we all are after the festive break. The Ralph Beckett filly has as good a form as Yimkin does, and interestingly her mother kicked the boss in the face when she was in training here… The are also some smart newcomers on pedigree and it will be an interesting race. I hope they both run well as it took a lot of manual labour to dig out the horsebox!